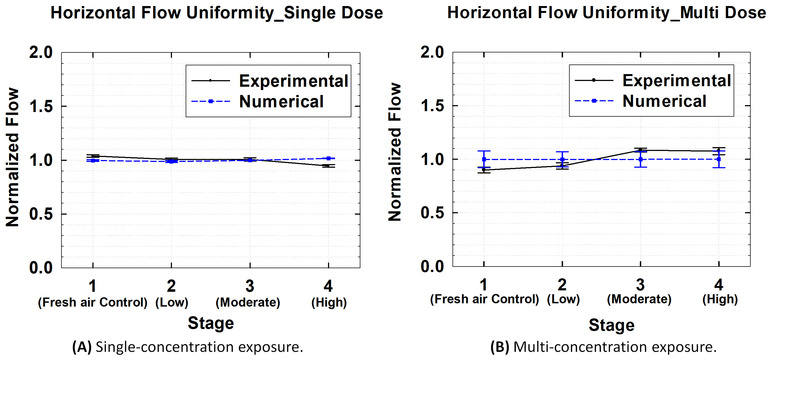 A nose-only inhalation toxicity chamber capable of testing inhalation toxicity at four different exposure concentrations was designed and validated for flow field uniformity and cross-contamination between the exposure ports for each concentration. Here, we present a protocol to confirm that the designed chamber is effective for inhalation toxicity testing. Yi, J. S., Jeon, K. S., Kim, H. J., Jeon, K. J., Yu, I. J. Development of a Nose-only Inhalation Toxicity Test Chamber That Provides Four Exposure Concentrations of Nano-sized Particles. J. Vis. Exp. (145), e58725, doi:10.3791/58725 (2019). Using a numerical analysis based on computerized fluid dynamics, a nose-only inhalation toxicity chamber with four different exposure concentrations is designed and validated for flow field uniformity and cross-contamination among the exposure ports for each concentration. The designed flow field values are compared with the measured values from exposure ports located horizontally and vertically. For this purpose, nanoscale sodium chloride particles are generated as test particles and introduced to the inhalation chamber to evaluate the cross-contamination and concentration maintenance among the chambers, for each concentration group. The results indicate that the designed multiconcentration inhalation chamber can be used in animal inhalation toxicity testing without cross-contamination among concentration groups. Moreover, the designed multiconcentration inhalation toxicity chamber can also be converted to a single-concentration inhalation chamber. Further testing with gas, organic vapor, or non-nanoscale particles will ensure the use of the chamber in the inhalation testing of other test articles. Inhalation toxicity testing is the most reliable method for assessing the risks of chemical agents, particles, fibers, and nanomaterials1,2,3. Thus, most regulatory agencies require the submission of inhalation toxicity testing data when the exposure to chemicals, particles, fibers, and nanomaterials is via inhalation4,5,6,7,8. Currently, there are two types of inhalation toxicity systems: whole-body and nose-only exposure systems. A standard inhalation toxicity test system, either whole-body or nose-only, requires at least four chambers to expose animals such as rats and mice to four different concentrations, namely fresh air control and low, moderate, and high concentrations7,8. The Organization for Economic Co-operation and Development (OECD) test guidelines suggest that the selected target concentration should allow the identification of the target organ(s) and demonstration of a clear concentration response7,8. The high concentration level should result in a clear level of toxicity but not cause mortality or persistent signs that might lead to death or prevent a meaningful evaluation of the results7,8. The maximum achievable level or high concentration of the aerosols can be reached while meeting the particle size distribution standard. The moderate concentration level(s) should be spaced to produce a gradation of toxic effects between that of the low and high concentrations7,8. The low concentration level, which would preferably be a NOAEC (no-observed-adverse-effect concentration), should produce little or no sign of toxicity7,8. The whole-body chamber exposes animals in an unrestrained condition in wired cages, while the nose-only chamber exposes an animal in a restrained condition in the confined tube. The restraint prevents loss of aerosol by leakage around the animal. Due to the high volume of the whole-body chamber, it requires a large number of test articles to be exposed to experimental animals, while the restraint of the tube in the nose-only exposure system hinders animal movement and may cause discomfort or suffocation. Nevertheless, the regulatory OECD inhalation toxicity test guidelines prefer the use of nose-only inhalation systems4,5,6,7,8. However, accommodating a four-chamber system, either whole-body or nose-only, is expensive, space-consuming, and requires a built-in air cleaning and circulation system. Furthermore, a four-chamber system can also require separate test article generators to expose animals to the desired concentrations, and a separate measurement apparatus to monitor the test article concentrations. Therefore, since standard inhalation toxicity testing involves significant investment, a more convenient and economical whole-body or nose-only exposure system needs to be developed for use in small research facilities. When designing an inhalation chamber, computational fluid dynamics (CFD) modeling is also frequently used to achieve particle, gas, or vapor uniformity9,10,11,12,13. Evaluation by numerical analyses and validation by experimental results has already been performed for the whole-body exposure chamber for mice10. For example, the air flow and particle trajectory have been modeled using CFD, and the uniformity of particle distribution has been measured in nine parts of the whole-body chamber10. 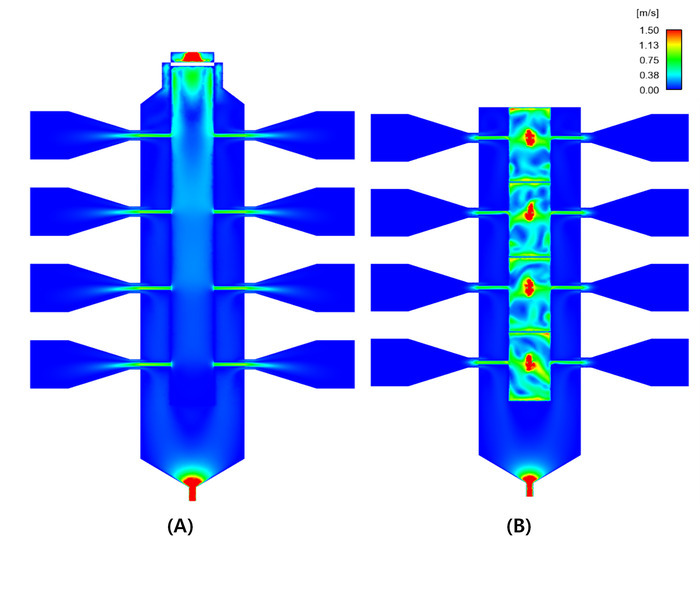 Also, the nose-only chamber has been evaluated by numerical analysis by CFD13. After that, evaluation for the nose-only exposure chamber was performed by comparing the numerical analysis results with an experimental study using nanoparticles13. This study presents a nose-only inhalation chamber system that can expose experimental animals to four different concentrations in one chamber. Initially designed using CFD and a numerical analysis, the proposed system is then compared with an experimental study using nanoscale sodium chloride particles to validate the uniformity and cross-contamination. The results presented here indicate that the presented nose-only chamber that can expose animals to four different concentrations can be used for animal exposure studies in small-scale academic and research facilities. The numerical analysis is set as follows, in the same manner as the experiment setting. For single-concentration exposure, the aerosol flow to the inner tower is set to 48 L/min and the sheath flow to the outer tower is set to 20 L/min. For multiconcentration exposure, the aerosol flow to the inner tower input is 11 L/min for each stage. The outlet differential pressure keeps at -100 Pa to maintain a smooth exhaust flow and prevent leakage. Assume the animal holders are closed and empty. 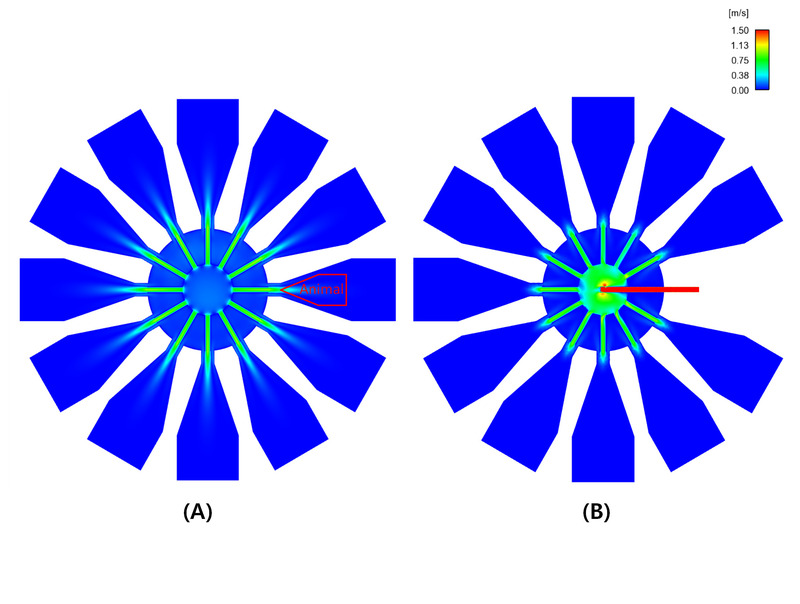 Perform the analysis of the flow field inside the chamber according to the geometrical shape, as described in Figure 1 and Table 114. NOTE: A numerical analysis of the flow field according to the geometric shape predicts the flow of the aerosol and evaluates it as a testable device. Design the chamber with 4 stages x 12 columns, 48 ports in total, where the core is divided into an inner and outer tower, as described in Figure 1B. NOTE: Each stage has 12 exposure ports for placing the experimental animals. Satisfy the recommendation suggested by the OECD Guidance Document (GD) 396. For the single-concentration exposure, place the mixing plate at the top of the inner tower to mix the test material and ensure a uniform concentration across the stages. For multiconcentration exposure, separate the inner tower into four stages and exposure concentrations by a separation disk. Divide the chamber into three parts: the inlet, sheath, and exhaust, as shown in the schematic diagram (Figure 2). NOTE: The inlet is where the aerosol flows into the inner chamber, and the sheath is the space between the inner and outer towers for extra air flow. Supply the aerosol (or test article) to the inner tower and experimental animals, while the exhalation from the animals that contains surplus aerosol flows out through the exhaust along with the sheath air. NOTE: The animal holders are closed and empty. Keep the inner pressure of the chamber constant using a blower and inverter, as the inner plenum pressure is controlled by the sheath air flow. Design equipment to measure the uniformity of the test aerosol (or article) concentration in the mixing chamber located in front of the nose-only exposure chamber in the case of single-concentration exposure. NOTE: The uniformity of the test aerosol can be evaluated by its particle number concentration and size distribution. Individual chamber concentration samples should deviate from the mean chamber concentration by no more than ±10% for gases and vapors, and by no more than ±20% for liquid or solid aerosols4,5,6,7,8. Thus, when the test particles are not constant, the aerosol flow can be bypassed through the exhaust fan. Check for leakages to verify the reliability of the test and ensure safety by confirming a closed system with ±500 Pa that is maintained for 30 min. NOTE: The leakage can be checked by soap bubbling. Set the total inflow rate of the aerosol (single/multi) and sheath air at 48 L/min or 44 L/min (single or multi, respectively) and 20 L/min, respectively, and keep the inner pressure of the chamber constant at −100 Pa in the Control settings of the User Interface. Maintain the temperature and humidity at 23 °C and 45%, respectively. Use a humidifier to control the humidity of the exposure air. Carry out an experiment in an isothermal-isohumidity-controlled environment to comply with the OECD inhalation toxicity guidelines4,6,7,8. Supply 48 L/min clean air to the inhalation chamber through a clean air supply including a HEPA filter controlled by a mass flow controller (MFC). NOTE: The clean air is made after filtering it with a HEPA filter. Stabilize the flow using the mixing chamber in the case of single-concentration exposure. Attach a supply nozzle to one port that injects fresh control air or the test aerosol (or article) in the case of multiconcentration exposure. Measure the flow velocity per port using a mass flow meter. Generate NaCl nanoparticles using a five-jet atomizer to evaluate the inhalation chamber design. NOTE: Use a 0.1%wt NaCl solution to generate the NaCl nanoparticles. Regulate the MFC to control the amount of production at 48 L/min of the NaCl aerosol mixed air in the single concentration and at 12 L/min of the NaCl aerosol-mixed air in the multiconcentration every four stages. NOTE: Every port of the nose-only chamber receives 1 L/min (i.e., 48 ports/nose-only chamber (four-stage); 48 ports/four-stage; 12 ports/stage). Supply clean air for dilution in the bypass. NOTE: The count median diameter and geometric standard deviation of NaCl nanoparticles are within 76 nm and 1.4 maintain, respectively. Measure the particle size distribution of the NaCl nanoparticles emitted from the injection nozzles using a scanning mobility particle sizer (SMPS) composed of a differential mobility analyzer (DMA) and a condensation particle counter (CPC). Use an Am aerosol neutralizer to remove the static charge of the particles and reduce the particle deposition on the walls, thereby improving the measurement efficiency18. Maintain the ratio of the aerosol and sheath air flow rate of the DMA at 1:10 to keep the aerosol flow rate and sheath air flow rate at 1 L/min and 10 L/min, respectively. Set the flow velocity of the injection nozzles by supplying clean air at 11 L/min through the aerosol inlet. Select 11 port nozzles for each the four stages. Measure the flow rate to connect the flow meter to the selected nozzle. Repeat step 3.1.2 3x to verify the reproducibility. Set the flow velocity of the injection nozzles by supplying clean air at 48 L/min through the aerosol inlet. Randomly select 24 port nozzles among the 48 ports. Measure 3x to verify the reproducibility. Set the particle size distribution of the injection nozzles by supplying the generated particles at 11 L/min through the aerosol inlet (do this as described in section 2). Randomly selected six port nozzles among the four stages; measure 3x to verify the reproducibility. Set the particle size distribution of the injection nozzles by supplying the generated particles at 20 L/min and clean air at 28 L/min, making a total of 48 L/min through the aerosol inlet (as described in 2.4 and 2.5). Randomly select six port nozzles among the four stages. Measure the particle concentration, to connect the SMPS to the selected nozzle. Repeat step 4.2.3 3x to verify the reproducibility. Set three stages in the case of multiconcentration exposure. Connect two generators with different solution concentrations and a clean air line to the three respective stages. Set the particle size distribution of the injection nozzles by supplying the generated particles and clean air at 11 L/min through the aerosol inlet (as described in 2.4 and 2.5). Randomly selected one port nozzle from all three stages. Measure the particle concentration, to connect the SMPS to the selected port. Repeat step 5.5 15x to verify the reproducibility. 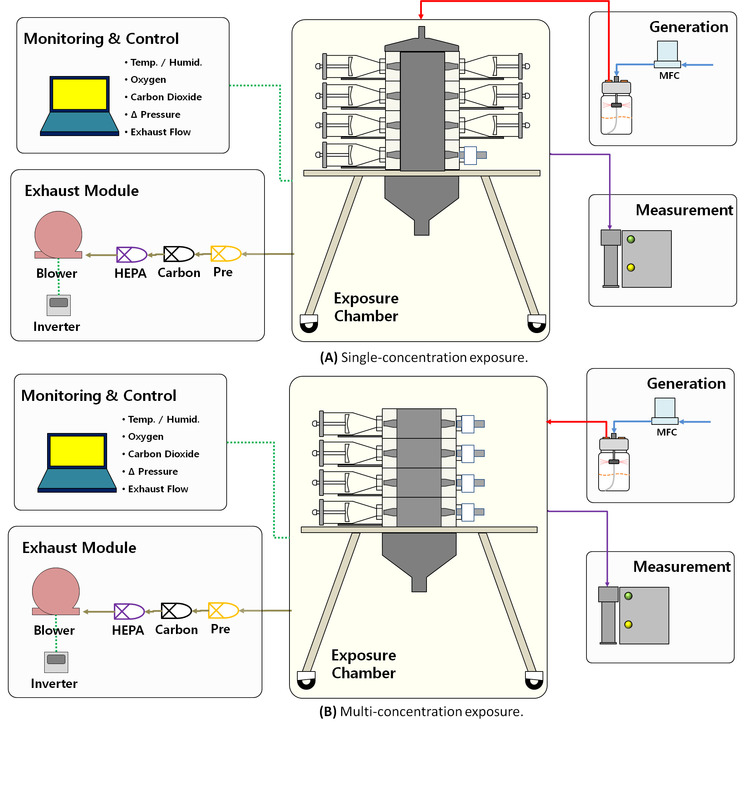 Figure 1 shows a schematic diagram of a nose-only inhalation chamber system, including a particle generator with an MFC, nose-only chamber, and particle measurement instrument for monitoring the air quality, controller, and exhaust module, based on section 2 of the protocol. Figure 2 shows the geometry of the nose-only inhalation chamber for multiconcentration exposure (Figure 2A) and single-concentration exposure (Figure 2B). The control fresh-air ports are located at the top, while the low-, moderate-, and high-concentration ports are shown in Figure 2A, based on section 1 of the protocol. The flow field for multi- and single-concentration exposure in the vertical and horizontal tower is shown in Figure 3 and Figure 4, respectively. The multiconcentration chamber has four flow fields, while the single-concentration chamber has one flow field (Figure 3A,B). 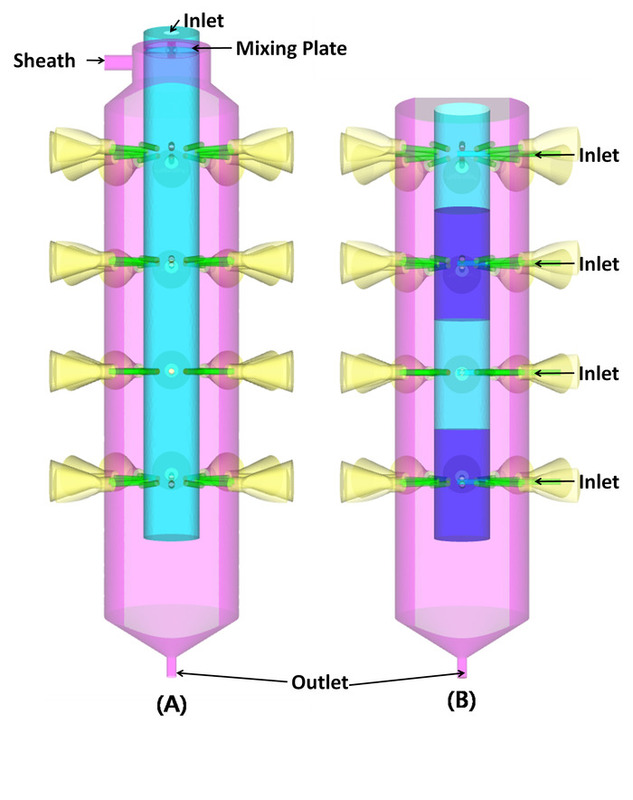 In the case of the single-concentration chamber, the flow from top to bottom is uniformly dispersed into the nose-only ports (Figure 4A), while the multiconcentration chamber is designed to deliver different concentrations of the test article to each stage of nose-only ports by supplying a flow from the air injection nozzles located in the middle of the inner tower using one port (Figure 4B). Figure 5 shows the flow field for the exposure concentration at each stage and is designed to avoid cross-contamination between each stage (Figure 5), based on section 1 of the protocol. The flow uniformity was evaluated using 12 ports located horizontal and vertical to the stages. 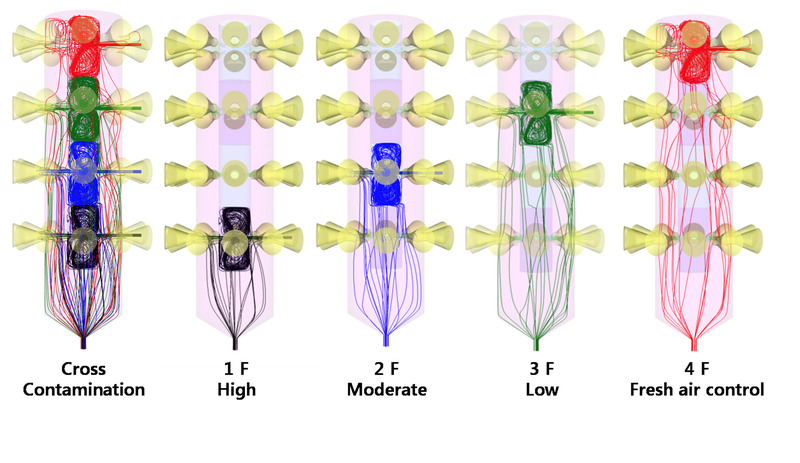 The numerically designed flow was similar to the experimentally measured flow through the 12 ports located horizontally in the single-concentration chamber and multiconcentration chamber (Figure 6A,B and Table 2). Moreover, the numerically designed flow was nearly the same as the experimentally measured flow through the 12 ports located vertically in the single-concentration chamber (Figure 7 and Table 3), based on section 3 of the protocol. The particle concentration was measured using six randomly selected ports located horizontally to the stages and showed identical concentrations in the single-concentration chamber (Figure 8A and Table 4) and multiconcentration chamber (Figure 8B and Table 4). 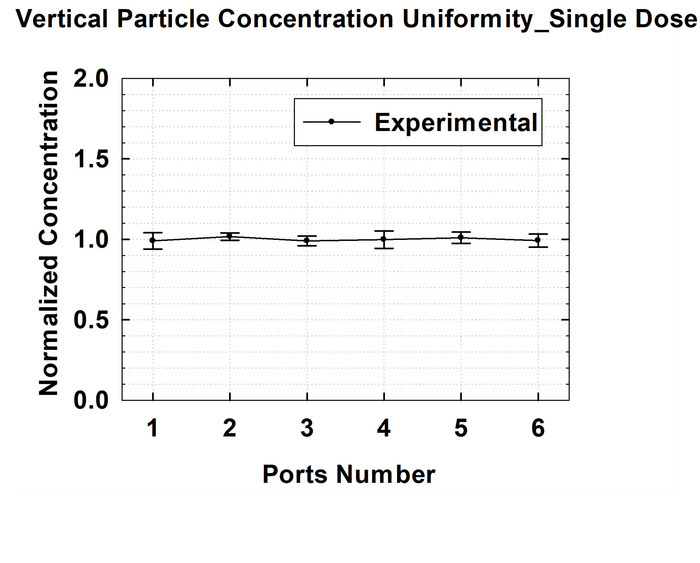 The particle concentration was also measured using six randomly selected ports located vertically to the four stages and showed identical concentrations in the single-concentration chamber (Figure 9 and Table 4), based on section 4 of the protocol. The cross-contamination was checked by measuring the sodium chloride particle concentration in the control and low and high concentrations. The results showed well-maintained concentration levels from the exposure ports for each stage (Figure 10 and Table 6), based on section 5 of the protocol. Figure 1: Schematic of the nose-only inhalation toxicity test chamber. It is divided into five areas (generation, exposure chamber, measurement, monitoring & control, and exhaust module), and can change the generation, exposure chamber according to the type of exposure. (A) Single-concentration exposure. (B) Multiconcentration exposure. Please click here to view a larger version of this figure. Figure 2: Geometry of the nose-only inhalation toxicity test chamber. (A) Single-concentration exposure. (B) Multiconcentration exposure. Please click here to view a larger version of this figure. Figure 3: Flow field of the vertical inner tower. (A) Single-concentration exposure. (B) Multiconcentration exposure. The colored bar indicates the flow field (in meters/second). Please click here to view a larger version of this figure. Figure 4: Flow field of the horizontal inner tower. (A) Single-concentration exposure. (B) Multiconcentration exposure. Please click here to view a larger version of this figure. Figure 5: Flow field for multiconcentration chamber cross-contamination. Please click here to view a larger version of this figure. Figure 6: Comparison of the horizontal flow uniformity. The error bars represent SD. (A) Single-concentration exposure. (B) Multiconcentration exposure. Please click here to view a larger version of this figure. 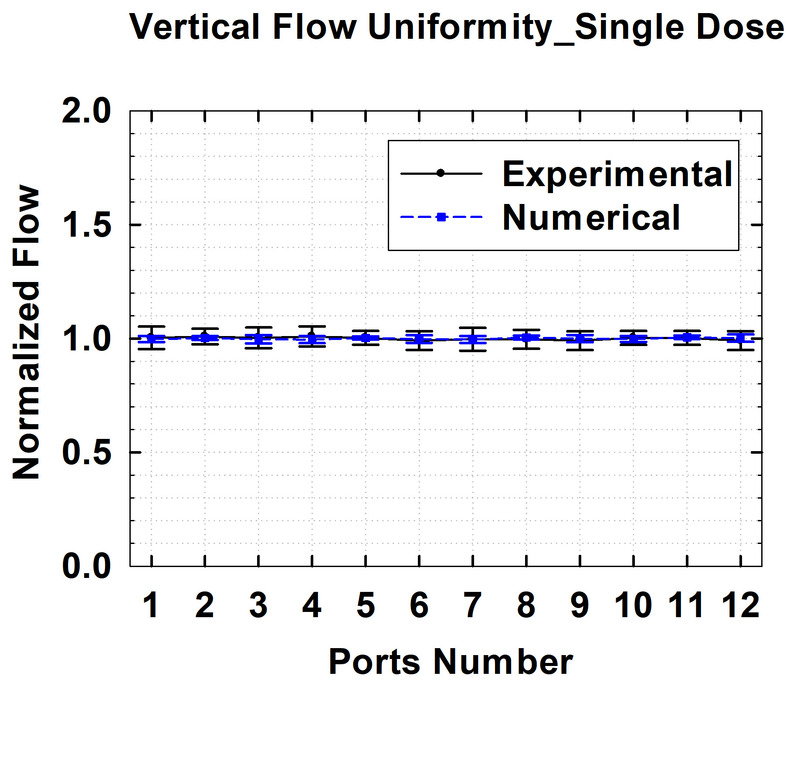 Figure 7: Comparison of the vertical flow uniformity. The error bars represent SD. Please click here to view a larger version of this figure. Figure 8: Comparison of the horizontal concentration uniformity. The error bars represent SD. (A) Single-concentration exposure. (B) Multiconcentration exposure. Please click here to view a larger version of this figure. Figure 9: Comparison of the vertical concentration uniformity. The error bars represent SD. Please click here to view a larger version of this figure. 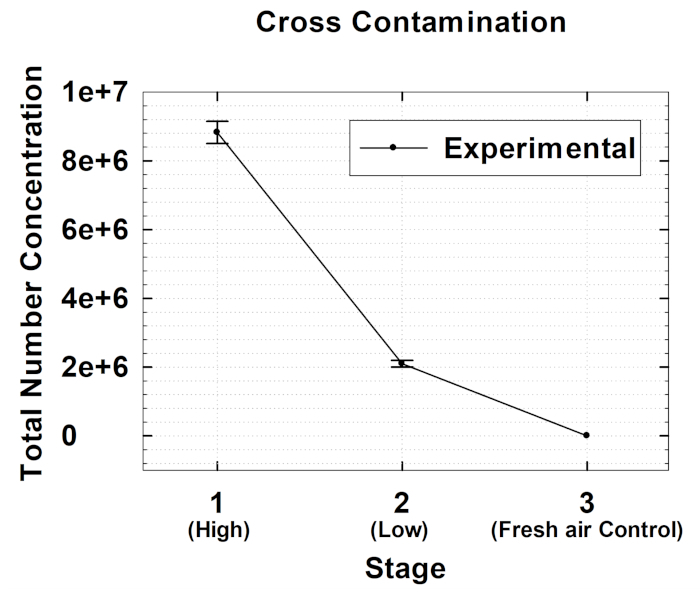 Figure 10: Results of the cross-contamination test. The error bars represent SD. Please click here to view a larger version of this figure. Table 2: Comparison of the horizontal flow uniformity. Table 3: Comparison of the vertical flow uniformity. Table 4: Comparison of the horizontal concentration uniformity. Table 5: Comparison of the vertical concentration uniformity. Table 6: Results of the cross-contamination test. Inhalation toxicity testing is currently the best method for evaluating aerosolized materials (particles and fibers), vapors, and gases inhaled by the human respiratory system14,15. There are two inhalation exposure methods: whole-body and nose-only. However, a nose-only system minimizes exposure by noninhalation routes, such as skin and eyes, and allows testing with minimal quantities of the test article, making it the preferred exposure method recommended by the OECD Inhalation Toxicity Testing Guidelines: acute4,6, subacute7, and subchronic8. A standard inhalation toxicity system requires four concentration chambers (fresh air control and low, moderate, and high concentrations). Thus, the operation is expensive, space consuming, and requires test article generation and environmental control systems. However, the multiconcentration inhalation chamber presented in this paper is more economical for use by small research institutes in the future. Based on the single-concentration inhalation chamber, the proposed multiconcentration inhalation chamber was designed and developed using a numerical analysis13. The resulting multiconcentration chamber can provide four exposure concentrations, including a fresh air control. The flow rate to each exposure port is appropriate, as suggested by Pauluhn and Thiel16, for directed-flow, nose-only inhalation chambers. 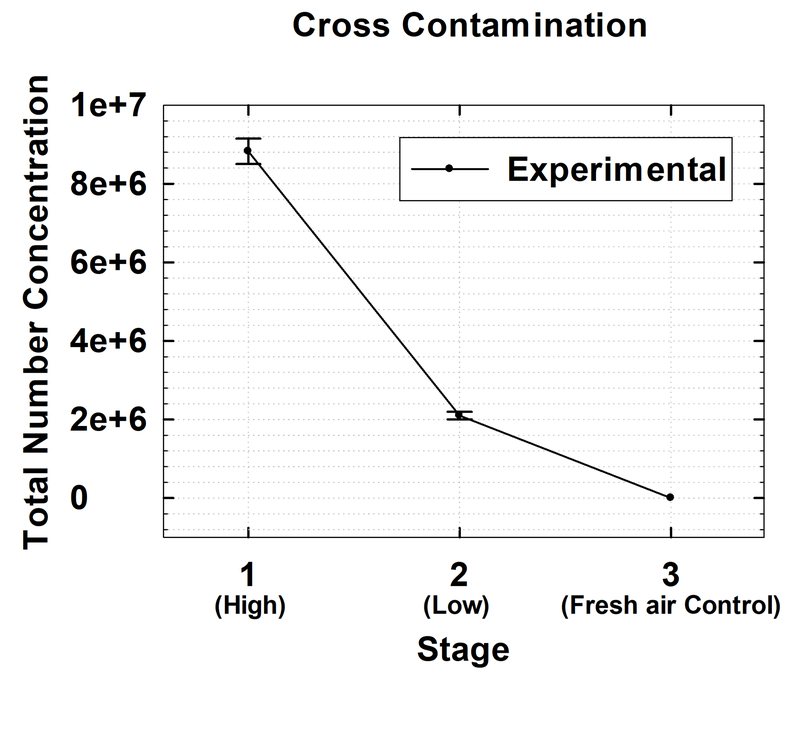 To validate the proposed CFD and numerically designed system in accordance with the existing verification procedure, the exposure port flow fields were measured horizontally and vertically for each concentration stage, along with the particle number concentrations to evaluate cross-contamination, which is a critical step (described in section 5 of the protocol), and the concentration maintenance using test aerosol sodium chloride. The designed multiconcentration exposure system showed a uniform flow field for the exposure ports from each concentration stage, no cross-contamination among the concentration ports, and consistent concentration maintenance. Thus, the proposed system could be effective for use by small research facilities desiring to conduct inhalation toxicity testing and studies. Since nanoparticle behavior (deposition by diffusion) in the air is very similar to gas or vapor17, the chamber could be used for gas and organic vapor inhalation testing. Testing the chamber with an organic vapor is planned, and the non-nanoscale particles will be tested in the near future. This research was supported by the Industrial Technology Innovation Program (10052901), Development of highly usable nanomaterial inhalation toxicity testing system in commerce, through the Korea Evaluation Institute of Industrial Technology by the Korean Ministry of Trade, Industry & Energy. Phalen, R. F. Methods in Inhalation Toxicology. Inhalation Exposure Methods. Phalen, R. F. CRC Press. Boca Raton, FL. 69-84 (1997). Moss, O. R., James, R. A., Asgharian, B. Influence of exhaled air on inhalation exposure delivered through a directed-flow nose-only exposure system. Inhalation Toxicology. 18, 45-51 (2006). White, F. M. Fluid Mechanics. McGraw-Hill. New York, NY. (2004). OECD TG 403. OECD guideline of the testing of chemicals 403: Acute inhalation toxicity testing. OECD. Paris, France. (2009). OECD TG 436. OECD guideline of the testing of chemicals 436: Acute inhalation toxicity - Acute Toxic Class Method. OECD. Paris, France. (2009). OECD GD 39. Series on testing and assessment Number 39: Guidance document on acute Inhalation toxicity testing. OECD. Paris, France. (2009). OECD TG 412. OECD guideline of the testing of chemicals 412: Subacute inhalation toxicity testing. OECD. Paris, France. (2018). OECD TG 413. OECD guideline of the testing of chemicals 413: Subchronic inhalation toxicity testing. OECD. Paris, France. (2018). Cannon, W. C., Blanton, E. F., McDonald, K. E. The flow-past chamber: an improved nose-only exposure system for rodents. American Industrial Hygiene Association Journal. 44, 923-928 (1983). Oldham, M. J., Phalen, R. F., Robinson, R. J., Kleinman, M. T. Performance of a portable whole-body mouse exposure system. Inhalation Toxicology. 16, 657-662 (2004). Oldham, M. J., Phalen, R. F., Budiman, T. Comparison of Predicted and Experimentally Measured Aerosol Deposition Efficiency in BALB/C Mice in a New Nose-Only Exposure System. Aerosol Science and Technology. 43, 970-997 (2009). Tuttle, R. S., Sosna, W. A., Daniels, D. E., Hamilton, S. B., Lednicky, J. A. Design, assembly, and validation of a nose-only inhalation exposure system for studies of aerosolized viable influenza H5N1virus in ferrets. Virology Journal. 7, 135 (2010). Jeon, K., Yu, I. J., Ahn, K. Evaluation of newly developed nose-only inhalation exposure chamber for nanoparticles. Inhalation Toxicology. 24, (9), 550-556 (2012). Ji, J. H., et al. Twenty-Eight-Day Inhalation Toxicity Study of Silver Nanoparticles in Sprague-Dawley Rats. Inhalation Toxicology. 19, 857-871 (2007). Ostraat, M. L., Swain, K. A., Krajewski, J. J. SiO2 Aerosol Nanoparticle Reactor for Occupational Health and Safety Studies. Journal of Occupational and Environmental Hygiene. 5, 390-398 (2008). Pauluhn, J., Thiel, A. A simple approach to validation of directed-flow nose-only inhalation chambers. Journal of Applied Toxicology. 27, 160-167 (2007). Aitken, R. J., Creely, K. S., Tran, C. L. Nanoparticles: An occupational hygiene review, Research Report 274. Available from: http://www.hse.gov.uk/research/rrpdf/rr274.pdf (2004). Hansen, S. Charging of aerosol particles - An investigation of the possibility of using Americium-241 for SMPS chargers. Available from: http://lup.lub.lu.se/student-papers/record/8950313 (2018).